Watching shellac dry is not much fun, so as things progress on the tall clocks I decided to knock out a promised-to-build, small box. It is close in design to the tea caddy I built for a magazine article a couple of years back. This box doesn’t use edge banding, so the work is a bit easier. 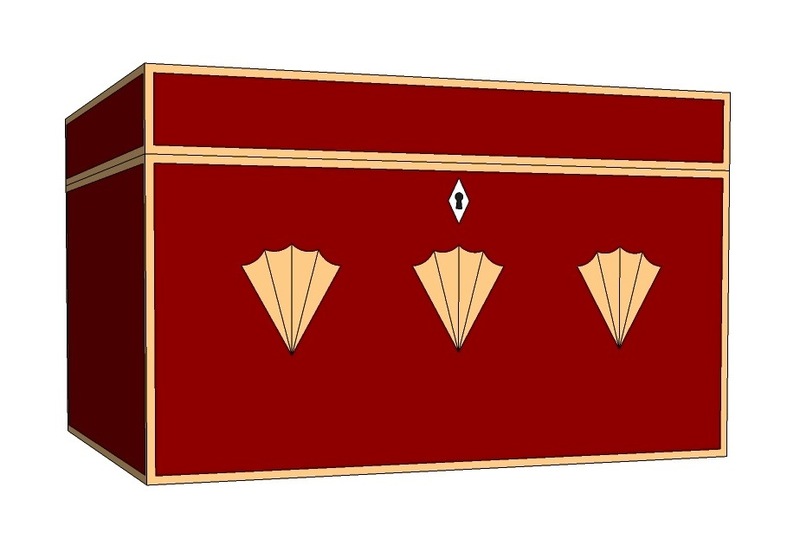 The artist rendition (actually my drawing from SketchUp) looks too red; I’m building the box out of mahogany and using tiger maple for the trim pieces. I’m writing about this not so much for the value of the project, but more for the techniques I use as I build – there are methods used that can be employed on other projects. The four horizontal parts of the box were milled to size and thickness. I made the pieces 1/2″ thick; width and length are your call if you’re building along. The first big step is to bevel the ends of each piece, and you know there are many different methods you can use. I choose the table saw for a couple of reasons: It’s easy to use, I can set up the miter gauge to be square and once the blade is set to 45°, I can use the same setup for two operations. The photo (at right) shows the setup used to bevel the ends. A sacrificial fence with a cut ran through it after the blade was beveled, makes it easy to locate the box parts to trim. I also added a stop-block to keep the parts from creeping away from the blade as the cut is made. One additional point you should glean from this image is my hand placement. My first inclination was to grab the gauge with my right hand and hold the part with my left. If that happened, my left arm would – at some point in the cut – completely block the blade from my view. That’s not good. The next cut to make is for a spline to run up the corners. I learned a long time ago that making a 45° cut into a previously cut 45° bevel results in a cut that’s 90° to the bevel cut. (What did he say?) Using the same table-saw setup but placing the gauge on the opposite side of the saw blade, makes the next step cake. Once again, make a pass over the blade to establish where the cut hits the sacrificial fence to use to align the parts, then position one piece to that kerf. 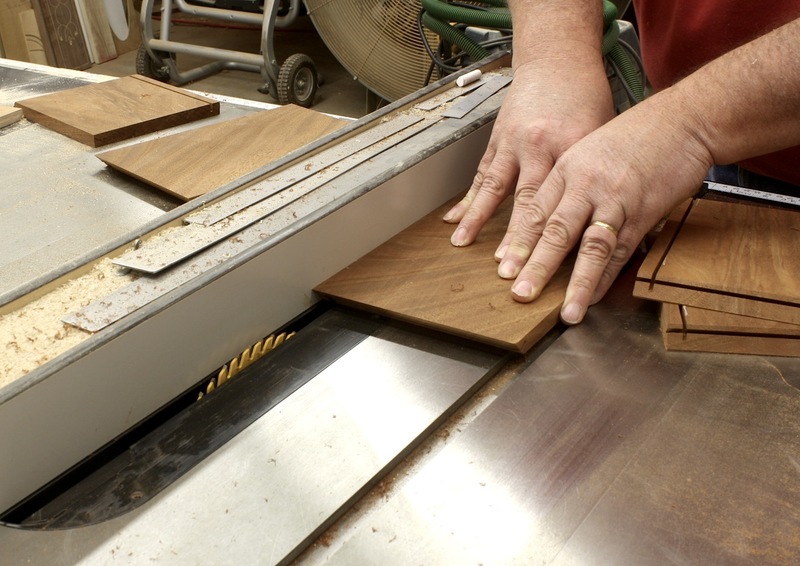 Make sure to dial back the blade height, then clamp a stop-block in position to use as a guide for each cut. Notice how I switched my hand placement for this round of cuts. I’m going to set the box bottom inside the four horizontal parts, so I need a groove cut along the bottom edge. Many woodworkers would gravitate to a dado stack for this step, but to me, this is a waste of time. A couple of passes with the blade set to the correct height and the fence properly positioned and you’re done with the groove. Easy, peasy. And there’s no need to swap blades. The action is picking up. Next step is the bottom. This I made from tiger maple. (Yes, I know you’re not going to see the bottom most of the time, but I have so much scrap tiger maple around my shop it’s a crime not to use the smaller cutoffs for something.) To rabbet the edges to fit into the roughly 1/4″-wide grooves, I use a two-step method at my table saw – what can’t you do with this machine? The process is straightforward. After you get the necessary measurements from the box parts – you can measure the width and length right in the grooves of the front and end – cut the bottom to size (you may want to go a bit less in width to accommodate for any seasonal movement if your box is on the wide side. The first pass is with the bottom face down against the table top – set the blade height to leave a 1/4″ of material after the cut. I make a 3/8″-wide rabbet to make sure the edge doesn’t interfere with the box as it goes together. The next step is to readjust the blade height to just tick the top edge of the previous cut (with the part standing on edge at the fence), and to set the fence to leave the tongue thick enough to slide into the groove. While it doesn’t make much of a difference here, it’s good practice to run the end-grain cuts first. After you cut pieces to fit into the spline cuts, it’s time to assemble the box. 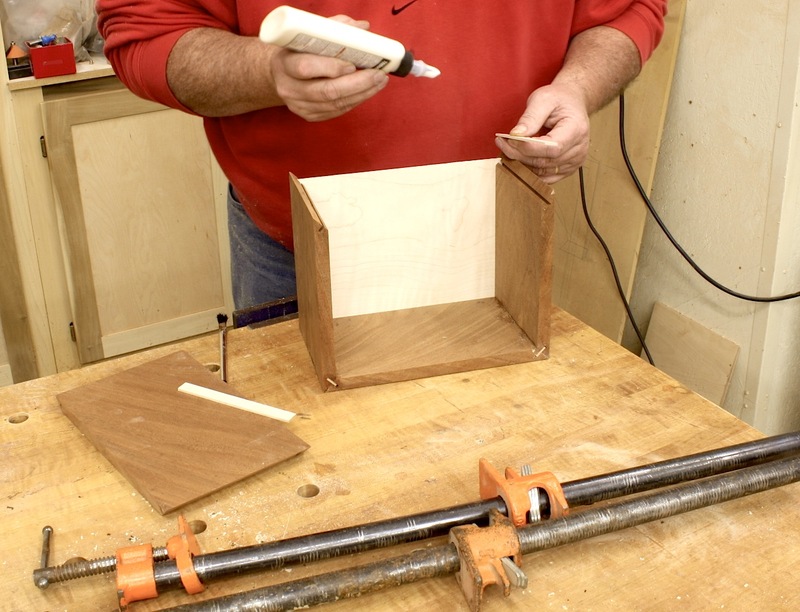 Two points to make here: Your splines cannot run from top to bottom – you need to stop them at the groove or your bottom will not fit, and only assemble the box at two of the four corners at the beginning. If you do glue all four corners, make sure you install the bottom as you assemble the parts. I like to glue half the box, then slip in the bottom and finish the assembly later. Working all four corners and the bottom at the same time can get busy. 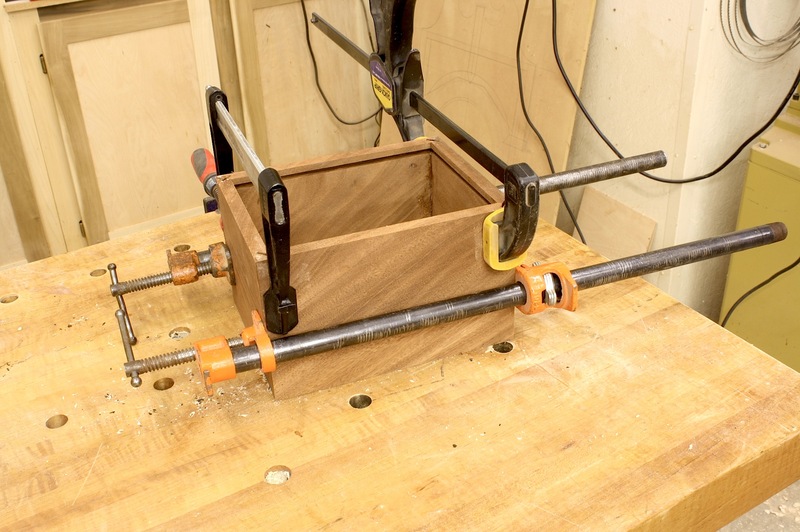 Add a few clamps and set things aside. After the glue dries, slip in the bottom, add glue to the remaining splines and corners, then put the clamps back in position and let it set. In a later-to-come post, I’ll add a top to the assembled box, split the lid off the base then add some trim pieces. After that, I’ll make the fan inlays to complete the box.